Brain InjuryWhat are the health benefits of exercise? Time magazine’s cover story this week is on the science of exercise. In light of this, the magazine published an online piece about the seven surprising benefits of exercise. Here are some of them. 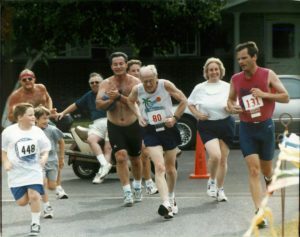 My father Gordon Selby Johnson, Sr. finishing a sub 53 minute 10k on his 80th birthday. Note the number on his tag. Hollandfest Run, Cedar Grove, WI. July 26, 1998. Photo by Marja Hunter. Exercise can help new blood vessels develop in the brain. It also releases chemicals that dull pain and lighten mood, such as dopamine, serotonin, norepinephrine, and endorphins. Exercise is linked to less depression, better memory and quicker focus. It increases blood flow to the brain, creating new blood vessels and brain cells. The protein brain-derived neurotrophic factor (BDNF) causes new neurons to generate and helps repair and protect brain cells from degeneration. An added benefit of BDNF is that it may heighten focus. Exercise is also the best way to protect against the neurodegenerative Alzheimer’s disease. In addition to preventing or delaying Alzheimer’s, exercise may generally make you age slower. A July 2016 study in the journal Science Advances suggested that moderate-intensity exercise may protect against aging. Telomeres are the protective caps at the end of each strand of DNA, comparable to the plastic tips at the end of shoelaces. As our cells divide again and again, our telomeres begin to shorten with age. In the study, 10 people did 45-minutes of moderate exercise on a stationary bike. The researchers took a muscle biopsy and blood samples both before and after the exercise. Exercise was shown to increase the presence of a molecule that protects telomeres, slowing down the process of aging. In fact, shorter telomeres are associated with shorter life expectancy and Alzheimer’s disease. As a result of exercise, the body is better able to burn fat for energy instead of carbs, causing fat cells to shrink. Burning fat requires a lot more oxygen than burning carbs. Both are used as energy sources. Exercise strengthens the cardiovascular system, so the body gets better at delivering oxygen. As a result, we are able to burn more fat as an energy source. Your fat cells, which produce chemicals responsible for chronic low-grade inflammation, shrink. Inflammation also decreases. The article reports that 80.2 million Americans over the age of 6 are entirely inactive, but with this knowledge, hopefully more people will start to see the health benefits of exercise. One doctor, Claude Bouchard, director of the human genomics laboratory at Pennington Biomedical Research Center in Louisiana, even said that exercise is more powerful than any pill. In addition to these health benefits, exercise helps immensely with mental health. A 30-minute brisk walk can help with depression just as much as taking an antidepressant. Regular exercise can allow people to reduce the dose of the psychiatric medication they may be taking. Plain and simple, exercise is just good for you. I hope that the Time magazine cover story will get people talking and raise awareness about the health benefits of exercise. Hopefully, people will get moving. They will be better for it.